Wauseon First Assistant Chief Phil Kessler, left, informed City Council on Monday’s rescue task force school shooter mock drill Oct. 30 at Wauseon High School, which will involve Police Chief Keith Torbet, right, and his department, as well as the county sheriff’s office, FCHC, and Lucas County EMS. Plans for a coordinated rescue task force school shooter mock drill Oct. 30 at Wauseon High School are ready to go, City Council members were told during Monday’s regular meeting. In his Council report for the city’s fire department, First Assistant Fire Chief Phil Kessler said the joint operation will include participation from the school district, city fire and police crews, the Fulton County Sheriff’s Office, and Lucas County EMS. The mock drill will simulate an active shooter while high school classes are in session. City streets will be blocked off during the drill. Mass casualty “victims” of the shooter will be triaged at the school by law enforcement and emergency personnel, then transported to the Fulton County Health Center to test the facility’s readiness and efficiency in the event of an actual situation. The mock drill at the school will last about an hour, Kessler said Tuesday. The follow-up by all involved agencies will last the day. The assistant chief said Wauseon High School students are aware of the mock drill but won’t know what time it will occur. Kessler said press releases about the mock drill, coordinated by Carrie Sigg, BSN RN, of Emergency Preparedness at FCHC, have been distributed over the last month. The Wauseon school district is currently the only county school district performing the exercise. In other business, Council members approved a recommendation by the Utility Committee to allow Haas Door to build a 150,000 square-foot addition over sanitary and sewer lines located underneath an unused railroad bed at its Krieger Street site. Conditions include the company’s responsibility for any and all necessary repairs of those lines. At a committee meeting held Oct. 1, Public Service Director Dennis Richardson suggested the company could upgrade the lines and install manhole covers for easy access. The Council bypassed the rule of three readings and passed on emergency a resolution authorizing Mayor Kathy Huner to enter a five-year lease agreement with Wauseon schools for a portion of the former Ohio Department of Transportation garage at 989 N. Shoop Ave.
Building and Grounds Committee member Harold Stickley suggested emergency passage “so we can speed it along.” He said the school district is anxious to move ahead with the lease agreement. The agreement had undergone several drafts, the final of which deleted an indemnification clause and added a termination clause requiring notice six months in advance from either party. The agreement will allow school buses to be parked outside the garage during daytime hours but not overnight. Council members had argued during the agreement process that buses parked on the property would create an eyesore from Shoop Avenue. • First Assistant Fire Chief Kessler also reported that the department offered a civil service test in September to fill staff positions vacated over the past couple of months. All tested individuals passed, and a second round of interviews takes place this week. Kessler said as part of Fire Prevention Month city fire crews are giving presentations in the city schools. He said on Oct. 20 the department will hold Safety Day at Ace Hardware, 1495 N. Shoop Ave.
• Police Chief Keith Torbet said a Drug Take-Back Day will be held Oct. 27, 10 a.m.-2 p.m. at Walmart, 485 E. Airport Hwy., Rite-Aid, 1496 N. Shoop Ave., and the police station, 230 Clinton St. All locations will accept unused and unwanted prescription drugs for safe disposal. Torbet reminded citizens that Halloween Trick or Treat will be held Tuesday, Oct. 30, 6-7:30 p.m. He also announced that the department’s next Use of Force class for citizens will be held Nov. 7 and Nov. 14. He said less than 10 spots remain open, and interested parties should contact the department at 419-335-3821. • Finance Director Jame Giguere said interviews for two openings in her department have been completed and candidates have been offered the positions. • The first reading of a resolution authorizing holiday pay for certain part-time police and fire employees. • Second readings of ordinances to: restrict signs in residential areas to 800 square inches, as opposed to signs not exceeding 25 by 32 inches; decrease the green belt from 20 to 10 feet for the rear and sides of a mobile home park, as consistent with state requirements; adopt the most recent version of the state’s fire code and all its appendixes. • Third readings of ordinances to: make possession of drug paraphernalia in the city a criminal offense in relation to marijuana use; include Section 957.04, which regulates use of city reservoirs, to the city’s codified ordinances; limit inspections of slow-moving vehicles to city residents or people or entities with businesses in the city. 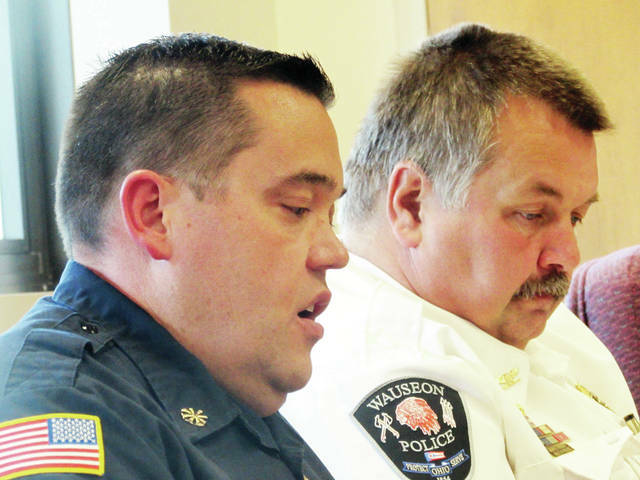 https://www.fcnews.org/wp-content/uploads/sites/45/2018/10/web1_wauseon-council.jpgWauseon First Assistant Chief Phil Kessler, left, informed City Council on Monday’s rescue task force school shooter mock drill Oct. 30 at Wauseon High School, which will involve Police Chief Keith Torbet, right, and his department, as well as the county sheriff’s office, FCHC, and Lucas County EMS. Reach David J. Coehrs at 419-335-2010.